20 Years From Now: Eburacon, Eboracum, Evorwic, Jorvik...YORK! Before we arrived John and I created a list of places we hoped to visit. The good news is we've managed to tick off some, but far from all. The history of York dates back thousands of years. There are roman ruins buried beneath Norman churches and medieval abbeys. Toss in the Vikings, Constantine, Henry VIII and my own ancestors and it's any wonder we've still so much to take in. The Yorkshire Museum (below right) does a great job of telling the story of York. Called Eburacon by the Celts, Eboracum by the Romans, Evorwic by the Anglo-Saxons, Jorvik by the Vikings and then finally York, the many informative exhibits devoted to each era seem endless. Even after three separate visits this week alone (yes, 3!) we're certain to discover something new upon our return. Our guide inside York Minster provided all sorts of intriguing tidbits from its beginning to recent and ongoing restorations. During the 1960s the discovery of cracks in the stone columns revealed the centre tower would collapse if not repaired. Workers dug down just in front of the Choir Screen (directly below the red object hanging in the centre of the above photo) and besides fixing the problem discovered a Roman road. 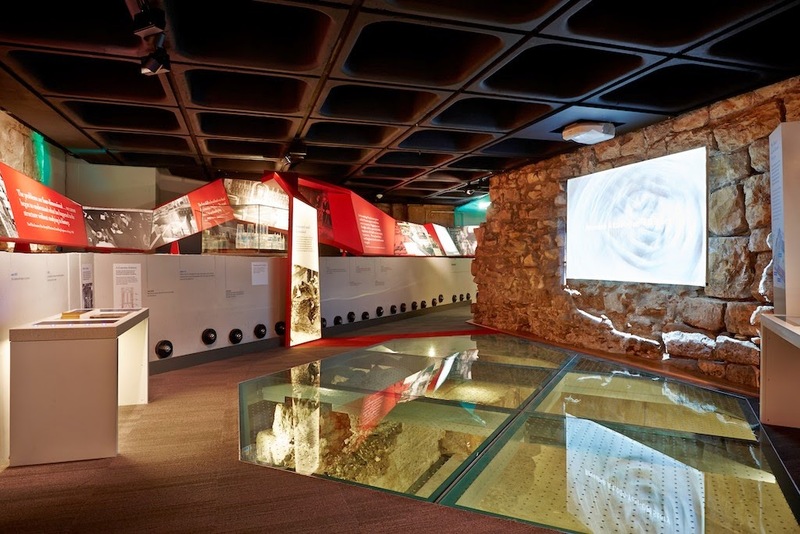 Rather than fill in the excavation upon completion of the restoration, the Undercroft was transformed into a fascinating exhibit beneath the Minster. I wish we could have audio on this blog because while we were touring the Undercroft a school choir sang high above us. The sound was glorious! York Castle Museum is located at the opposite end of the city and a few short steps from our flat. 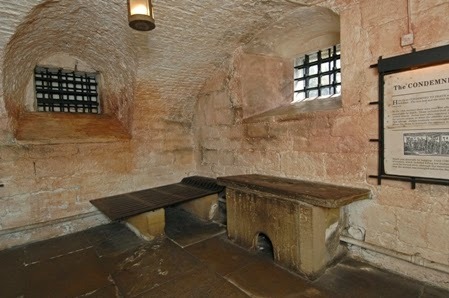 It's current exhibits include personal stories about some of the prisoners (men, women and children) who were held in the dungeon. I never imagined one of them would be my great, great, great grandfather...but James Colbeck was held inside the prison and this enclosed exercise yard. The wall on the right (above) is the light coloured outside wall between the mill in the foreground and the red building in the background below. A stonemason by trade, Yorkshire born James Colbeck worked on Buckingham Palace from 1822-1825. Being married with a young son, he grew tired of being away from home and returned to Dewsbury. Unable to find work or feed his family, he and two other men broke into a Huddersfield home and stole money, clothing and food. Having succeeded the first time they tried it again, but were caught. On March 22, 1828 James was tried and convicted of burglary and received a life sentence which meant being shipped off to Van Dieman's Land. 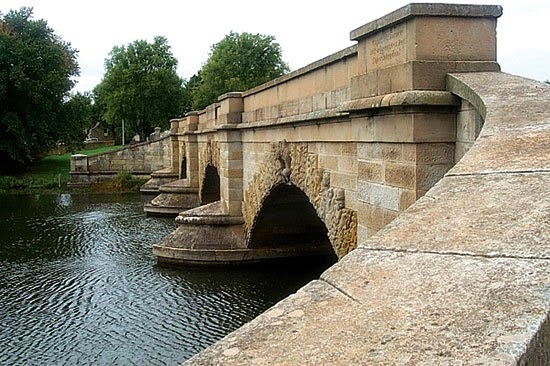 By November 1828 he arrived in Tasmania and three years later began work on the Ross Bridge (below). In 1835 he received emancipation and became overseer of the project. On October 28, 1841 he was granted a full pardon. There is no record how he returned to England, but he would have had to pay his way back. He returned to his place of birth, Dewsbury, and is registered on the 1851 census. Sadly, his first wife had remarried, but he took a second wife in June 1850. He died at the age of 52 and is very likely one of the few convicts to return from Australia to England. As you might imagine visiting Tasmania and walking across the Ross Bridge is now on my bucket list. I can also appreciate my great, great, great grandfather's determination to return to Yorkshire. What we've seen so far is impressive and inspiring. Take for instance Ye Olde Starre Inne's garden. Believed to be the oldest licensed pubs in York. It also provides a wonderful view of the Minster. The inside is inviting and cosy, and a pint of Guinness to accompany a hot pub grub lunch after a tough day of sightseeing truly hit the spot! There's no shortage of churches in York. This is all that's left of St. Mary's Abbey thanks to Henry VIII. Before its destruction it was the largest and wealthiest monastery in northern England. It's on the Yorkshire Museum property. St. Wilfred's Catholic Church is around the corner, between the Yorkshire Museum and the Minster. Notice the natural garland above the doors. Behind the Minster is the Treasurer's House. We didn't have time to venture inside, but the gardens were amazing. Plus, they provided a lovely view of the Minster. Scattered here, there and every where around York are flower baskets...still blooming at the end of November. Last but not least is this immaculate garden visible from the wall, and perhaps the only shot we have of the entire Minster.